Robi 4G New SIM 189Tk 6GB Internet, 400 Minute Talktime, Robi right now start a fantastic offer for new SIM connection. Robi provides 6GB internet and 400 minute talk time offer, not only that, local SMS bonus 28. This offer started 09/04/2018, So your new SIM must begin using after April 9 to avail 189Tk 6GB Internet, 400 Minute offer. 6GB Internet data and 400-minute talk time will use 15 days, 300-minute talk time Robi-Robi/Airtel, 100-minute talk time Robi- Another operator. 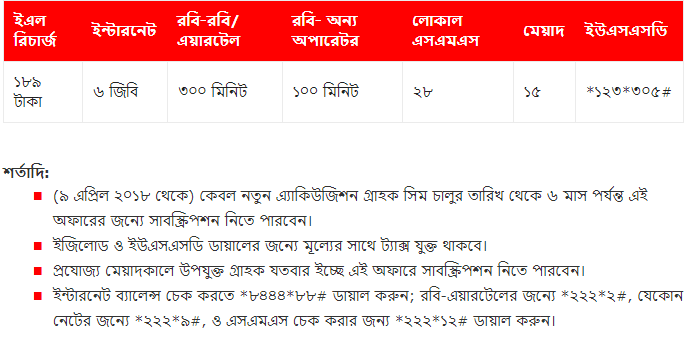 Robi 4G New SIM 189Tk 6GB Internet, 400 Minute Talk Time Offer full description is below. (From April 9, 2018), only new acquisition subscribers will be able to subscribe for this offer up to 6 months from the date of launch of SIM. During the applicable period, eligible customers can avail this subscription for as many times as possible. Tk 189 for the 6GB Internet, 400-minute talk time and 28 SMS. 300 minute talk time Robi-Robi/Airtel. 100 minute talk time Robi- Other operators. 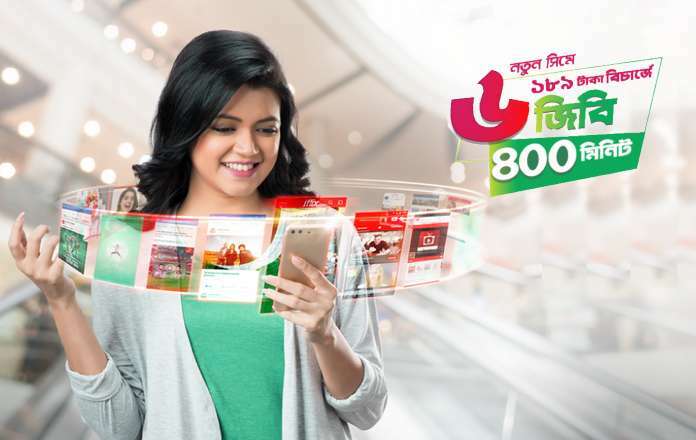 Robi 4.5G SIM price BDT 99. There will be the tax on value for EasyLoad and USSD dial. To check Internet balance just dial, *8444*88 #. Dial, *222*2 # to know Robi-Airtel minute. Dial, *222*9 # to check local number minute talk time. To check SMS balance merely dial, *222*12#. You are browsing Robi 4G New SIM 189Tk 6GB Internet, 400 Minute Talktime, if you need any help with this offer, please let us Thank you.